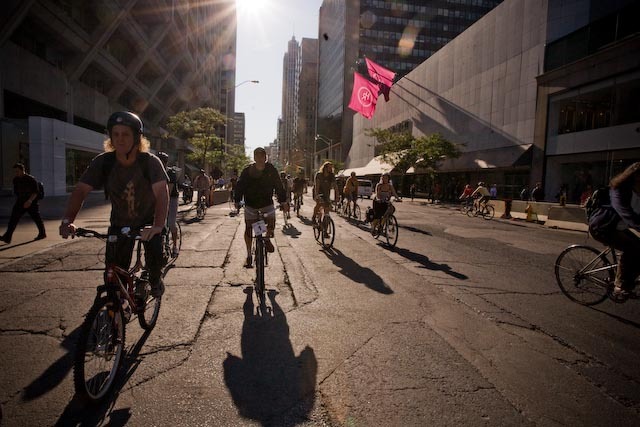 Cyclists arrive along Bloor Street, east of Avenue. 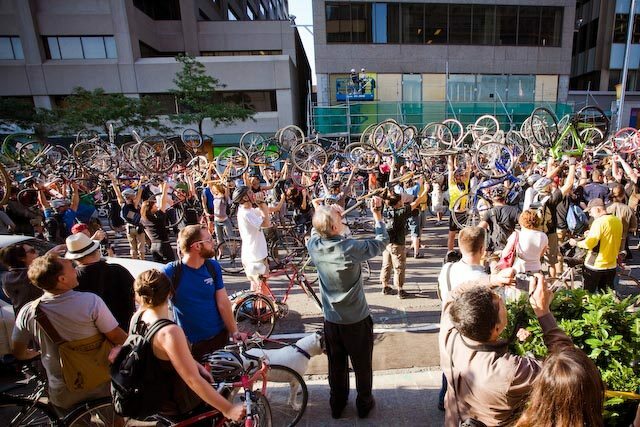 Earlier this afternoon, hundreds of cyclists converged on the stretch of Bloor Street West outside of the Sephora where, two nights previous, bike courier Darcy Allan—Al—Sheppard was killed. 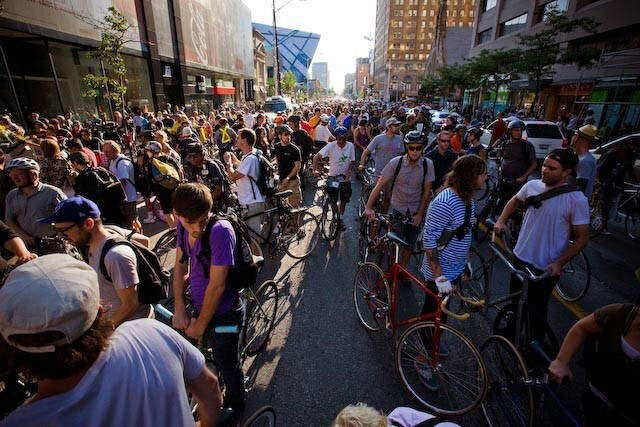 Many had just come from a mass ride that had started on Bloor at 5 p.m., picking up the crowd of about one hundred cyclists waiting at Bay and Bloor, and another crowd waiting at Bloor and Yonge, before riding together down Yonge, then along Queen, then back up University, escorted and gently directed by bike cops the whole journey. 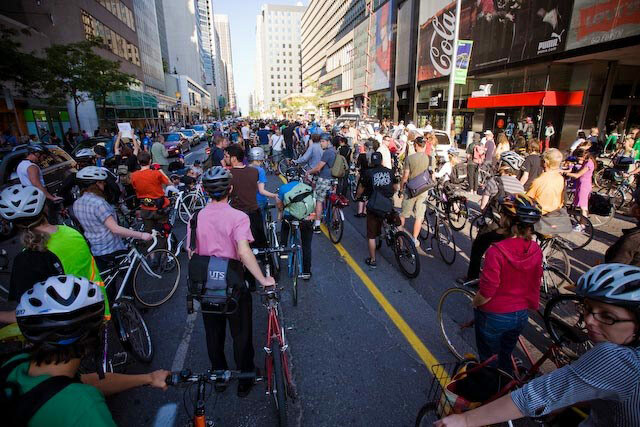 Above: cyclists wait at Bay and Bloor, where the protest was scheduled to start. Below: the pack makes its way along Bloor. Others we talked to hadn’t been so lucky. Above: along Yonge, near Dundas. Below: the cyclists pass Tamil protestors on University. 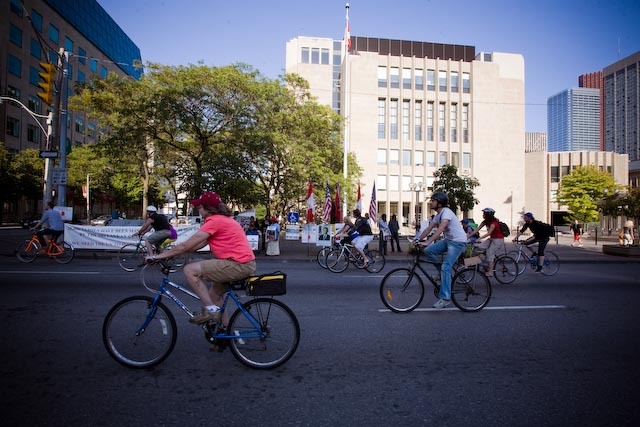 In spite of the massive number of cyclists, Bloor was never fully closed on Wednesday night. 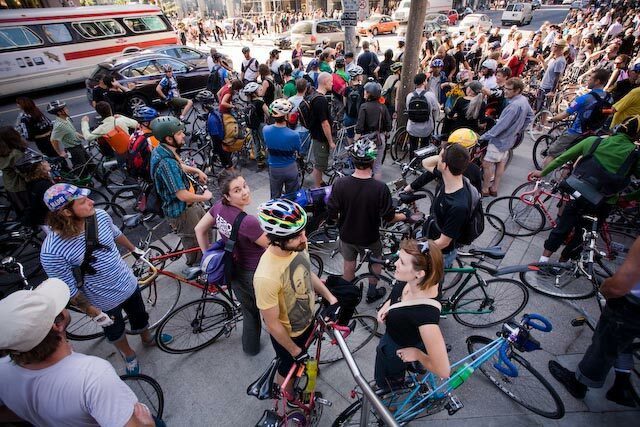 As the crowd of cyclists grew, the available lanes for cars shrunk and shrunk and shrunk, down to one westbound lane at one point, until a wailing ambulance was let through at about 6:10, pushing one more lane open, and police began to shut the protest down at 6:20 to cries of “shame,” in spite of the event that preceded it being yet another example of a protest that saw mostly cooperation between participants and police. By 6:45, three lanes, including one eastbound, were back open. 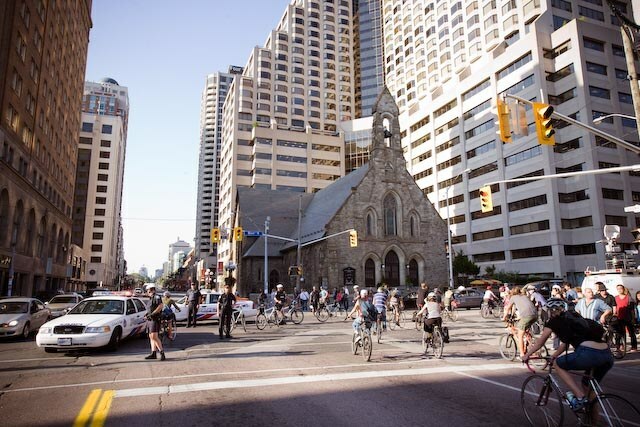 Above: cyclists turn back onto Bloor, routed by police officers. Below: bikes raised in unison. 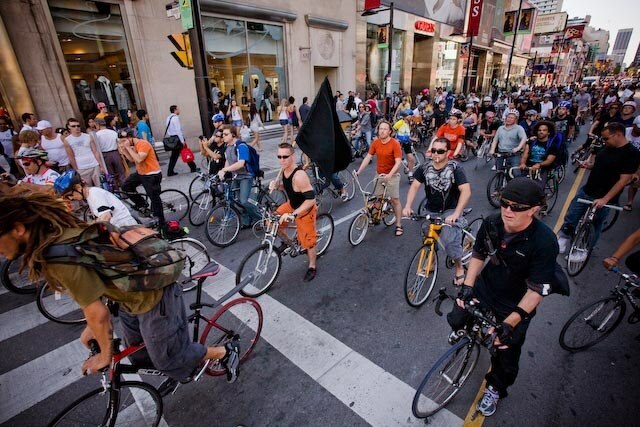 “What we’ve been advocating and will continue to advocate,” Bambrick explained, “is for the meaningful integration of cyclists and bicycles into our transportation network, into our shared public space—so that means bike lanes that not only allow people to move through the core but that allow people to come into the core from the suburbs,” and, in the suburbs, where speeds are higher and roads wider, lanes that are physically separated.